The Faculty of English and Global Communication trains human resources that can deal with the globalization of society, as they specialize in English as a common international language and acquire a cosmopolitan way of thinking, in Kyoto, a city of international tourism. At the Faculty of English and Global Communication, in addition to acquiring advanced English proficiency, students learn global communication skills based on extensive knowledge and cultural education relating to culture, society, business management and tourism. At the Department of English and Global Communication, through the international language of English, students acquire skills that can be utilized in business, in tourism, and in education, by deepening their understanding of multiculturalism and a variety of societies, acquiring presentation skills, and cultivating their abilities to deal with different cultures. 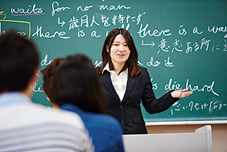 The Intensive English Program and the Study Abroad Program are pivotal in the acquisition of these skills, and are key features of the Department of English and GlobalCommunication's curriculum.